We made the first of our Christmas treats tonight. We did almond bark dipped pretzel rods and moldy cornflakes (a childhood favorite made by my Grandma Bonnie). Now I’m not sure where the name moldy cornflakes came from but that is all I’ve ever heard them called*. 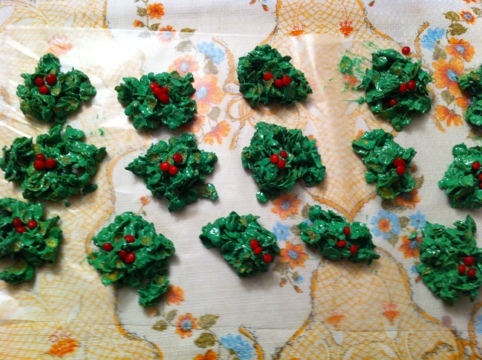 They actually resemble holly and berries and are similar to rice crispy bars, except here we’re using cornflakes. *update: Grandma Bonnie left this comment on my facebook wall about moldy cornflakes. I thought maybe you would enjoy reading it too. Put butter and marshmallows in a microwave proof bowl. Cook for 1 minute on high. Stir and cook another 30 seconds to 1 minute until the marshmallows are melted. Stir in a little green food coloring at a time until the desired color is achieved. In a large bowl measure out 5 cups of cornflakes. Pour marshmallow mixture over them. Stir to completely coat all the cornflakes. On waxed paper or parchment scoop out small bundles of cornflakes. Place a few red hots candies on top. Give your guests something special this year by grilling the turkey.